This is an awesome example of an inequitable 'test', Trevor. I love the cartoon. It is rife with meaning and innuendos. Great questions and thoughts to provoke us. Thank you. There is always other ways to skin this cat so to speak. I am reminded of the video, in our lesson this week, that shows the example of genius in kindergarten students in being able to see alternative answers to one question. Perhaps, all these animals could work togethor collaboratively to help one another succeed at this test - accommodation to help overcome one another's barriers? Intelligence based test questions can be biased against culturally and racial 'others'. Not to mention, in regards to the above cartoon, physical limitations. Perhaps, multiple choice questions would be more suitable. E.g. pick one of seven queries - able to live in sub-zero temperatures comfortably? able to be loyal to one's master? able to soar above all life forms? etc. Even Superman, Spiderman, and Batman have limitations. Test developers assume that test takers have no linguistic barriers (or differences) that inhibit their performance on tests. Test developers assume that the content of the test at any particular level is suitable and of nearly equal difficulty for test takers. Test developers assume that test takers are familiar with or have the test sophistication for taking standardized tests. Test developers assume that test takers are properly motivated to do well on the test. Test developers assume that test takers do not have strong negative psychological reactions to testing. These assumptions are very narrow and do not include many who are culturally different. Harmon (2004) agees that this assumptions are biased and, in effect, eliminate many test candidates who are intelligent and gifted. D. Harmon. (2004). Improving Test Performance Among Culturally Diverse Students. Understanding Our Gifted. Open Space Communications. Retrieved from http://www.davidsongifted.org/Search-Database/entry/A10477. A 2014 article, Equitable Access to Education for Children with Disabilities, by Anant Mishra, a former Youth Representative at United Nations, shares that the United Nations defines disability as “any restriction or lack (resulting from an impairment) of ability to perform an activity in the manner or within the range considered normal for a human being” (Equitable Access to Education for Children with Disabilties). This article addresses the selfsame issues this cartoon attempts to portray - despite the limitations of children with various and diverse handicaps to a certain situation presented to them from which they are judged and/or defined all children have other skills/abilities/talents to offer. Many with handicaps succumb to 'hiding' from the 'tests' so that society will not notice them - 'invisible' handicaps within countries. The solutions for equity for all children, no matter their shortcoming(s) are a basic human right. The Convention on the Rights of Persons with Disabilities was formed in 2006 to protect all children's rights to an education. The guidelines within this Convention suggests that schools, teachers and administration to provide those children with disabilities "full and equitable access to schools and education" without segregation. However, many with disabilities further limited by "class, culture, location, disability type, and overall physical, political, and attitudinal barriers of their environment" (Mishra. A. 2014). There are two examples of accommodation needed for two of the children in my class. At present they are removed from the classroom when they are disturbing others. They are sent to work with another educational professional in isolation. Is there another way that those in the classroom who are 'disruptive' can be successfully integrated within the classroom with their classmates? Are some disabilities to far advanced to be included within normal classrooms? How are these issues to be addressed? Is it fair to other children to have attention diverted to these 'other' children? Is support for each individual in an individualized manner, as Mishra suggests, feasible? Likewise, who decides what reasonable accommodations means and to what extent it should include? I definitely appreciate the amount of effort and research you put into contemplating the hook this week. It is quite clear from this effort and from each of the discussions that you have been involved in so far that you are more than willing to go above and beyond what I would have expected as a response. 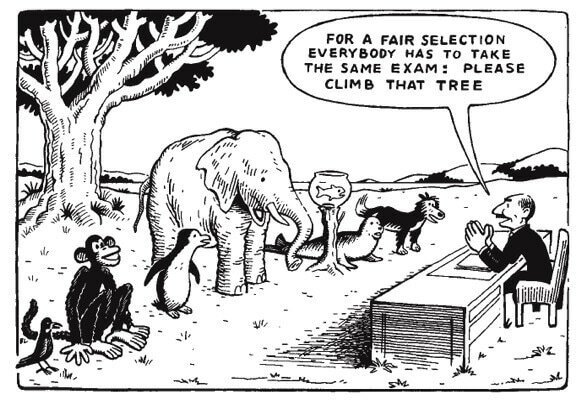 I enjoyed your contemplation through your research of standardized testing, I personally had never made the connection in relation to the cartoon as representing children dealing with disabilities! On the idea of standardized testing I would like to propose a question. Do you believe that there is some merit to developing a cohesive society through standardized testing? Or would allowing the individual strengths of each student (as opposed to grading on one single concept and method) to shine through in education be the only "positive" way of moving forward? (I apologize if my wording is difficult to understand). Thank you for your research and creativity in presenting us with some great hooks. I had not thought much about the technicalities of the multiple pathways of learning before this course. Your hooks look like fun, they appear pretty straightforward and definitely interesting! I like the 4MAT technique because it reminds me of the process of writing the research paper that we submitted for this course. It flows from an introduction, to information, then application and finally summarizing what we have learned. Think-Tac-Toe sounds awesome for the primary grades and incorporates a little bit of art and computer skills into the lesson. Bringing mom and/or dad into the lesson is cool, too. Orbitals is a great strategy for projects that benefit greatly from collaboration. Through this format children learn to trust and depend on each other to get the job done. However, one may find that there are those that jump right in to do their part, others might do what they are asked to do as part of the group, and others that ride on the coattails of others. This is the reality of the real working world as well. I believe RAFTS can be used for many subjects, not just writing assignments. For example, drama, cake/cookie decorating in Advanced cooking class, speech presentations, and social studies reports. I believe all children can learn to appreciate all modes of learning. They are sure to excel at some of them or maybe even all, however, an appreciation and working knowledge of as many learning styles as possible. In my school I am seeing all the students do the same thing together at the same time, with the exception of a student or two who find it hard to settle their little bodies and minds. :) I think because it is grade one the focus is centered on reading. During gym the substitute teacher had the children do the actions for the sounds of the alphabet. However, they sounded different than Jolly Phonics Sounds. I have seen this program being used in a Regina Catholic School. I heard of it a couple of decades ago and liked the concept. For the pumpkin topic the children not only did their paper work but were able to dissect the pumpkin the next day to see what they had learned about the inside of the pumpkin using the real thing. Not only do they learn to colour realistically but they have many opportunities to colour using their imagination. So you might see a purple dog, a black kite or a blue person. Math lessons so far have been without use of workbooks and instead are focused on hands on activities and visually becoming aware of numeracy. - questions needs to be asked: what works? What does not? What are the challenges? How do I get a better understanding of each student's capacity to learn? How do I respond to that? Tanya, you pointed out that diversity makes learning exciting, which I agree with. Not all schools are open to diversity, why do you think that is? Why do you think people are so hesitant to change the curriculum? I think most of us are afraid of change. We do not mind other's changing, however, when it comes to us the mindset is 'you first'. I believe if a people group or those making the decisions have certain prejudices it is difficult to get past that. I believe the same reasoning applies to school funding. The better and wealthier a neighbourhood is the more monies/funding/perks they will receive. DONE! Here are your results. The strong results I received are the norm for me. I can be extremely intense and, also, score equally strong as an ESTJ personality on the MBTI® (Myers-Briggs Type Indicator) test. "When people differ, a knowledge of type lessens friction and eases strain. In addition it reveals the value of differences. No one has to be good at everything." Core Values - The core values are the guiding principles that dictate behavior and action. Core values can help people to know what is right from wrong; they can help companies to determine if they are on the right path and fulfilling their business goals; and they create an unwavering and unchanging guide. My core values are punctuality, courage, life-long learner, perseverence, and overcoming adversity. ​I believe the more we know about ourselves the better equipped we are when teach children.The differentiation flow chart is our blueprint for top down learning that embraces and contributes to all children's success in the classroom. There are still changes that need to be made to better integrate children with differentiated learning needs so that they can be included instead of excluded. The drawback to exclusion is the child may feel ostracized and alienated by their peers. Every child needs a teacher to response to their learning needs not to the needs of the teacher. Tanya, your results ranged from 0% to 100% which I found interesting. Since you were strong in linguistics, logical-mathematics, and naturalistic I am curious as to what subjects you want to teach. I want to teach English so I was happy that my linguistics percentage was higher. I completely agree that one should know themselves before teaching others and that the needs of the students are the most important. Thanks for sharing! Thanks a lot for sharing, Im sorry that I am late getting back to you. I find it interesting that you scored 100% in an area but also have strengths in others as well. I agree on your point about how a student may be criticized by their peers through being excluded in the classroom. Thanks a lot for sharing! I am shocked and saddened with the news of the U.S. election and trying to imagine what this will mean for so many people in the world. I truly thought we'd be celebrating the first woman president being elected. Please take time to have a conversation in your group as this result pertains to the topics in this course, to all of us as people and to our work as educators. I'm sharing messages from Hillary Clinton, from Jennifer Tupper, our UofR Dean of Education and encouraging you to read the article called "What do we tell the children?" (linked below). As I listened to Hillary Clinton this morning I jotted down some of her message. She stated, "This is painful and will be for a long time. But we need to continue to build an America that is HOPEFUL, INCLUSIVE and BIG-HEARTED. We MUST accept the result and move forward. We must hold onto the principle that we are ALL equal in rights and dignity, have freedom of expression and we must defend these rights. The American Dream is big enough for everyone, for people of all races, religions, for men and women, for immigrant people, for LGBTQ people and people of disabilities...for EVERYONE. We ARE stronger together." from Jennifer Tupper, "I am writing in the wake of the American Election results to express to each one of you my gratitude for the work you do in this Faculty to prepare our teacher candidates and graduate students to take up anti-oppressive ideas and pedagogies in pursuit of a socially just and equitable society. Now, more than ever, there is an urgency in this work. I really believed that commonsense and intelligent thought would prevail, but it did not. Instead, hatred and racism prevailed. I cried with my daughters this morning as we considered what a Trump presidency means for all women, members of minority groups, marginalized peoples and progressive thinkers. I cried with them as we thought about the protests in Standing Rock and what a Trump presidency means for the Indigenous peoples and their allies in the United States. While we have no choice but to accept the outcome of this election, we must remember that prejudice, misogyny and discrimination are not democratic values. I wanted to share a link to an article that was published late last night in the Huffington Post that helps Americans to think about how they might talk with their children and how teachers might talk with their students about the election results. Perhaps it may be of use to us as well. What do we tell the children? Tell them first that we will protect them. This is an extremely touchy subject for many Canadians. Why, because there are many in Canada that support what Trump wants to accomplish for his country and the relationship he wishes to build with America's Allies. Trudeau, this morning congratulates Donald Trump. Justin Trudeau reaches out his hands in welcoming respectful and meaningful dialogue with our neighbour's new leadership. I believe we must respect the decision of the people who are our neighbours. It was a democratic vote and the majority, obviously, trust Trump over Clinton. There is a congress in place that is able to trump decisions that are not acceptable to the majority. However, I feel that the emotions of the masses have made monsters out of both Hillary Clinton and Donald Trump. I believe once the dust settles and the US government gets back to work things will level out. Yes, many things might change right away. I feel that Trump truly cares for all people. I feel that the new President will bring the US budget into line and all of North America will benefit. I admire him for wanting to look out for their own country first and then reaching out to others, as America is able, to help them, too. I do not believe he will be reactionary to calls for interfering in other countries disputes, but will weight the pros and cons before 'pushing the button'. One little girl in the school where I work came up to me and said she was worried about the walls that were going to be built both across the Canada/US and the Mexico/US borders. Yes, little ones hear others talk about the results and the reverberations before, actually, seeing anything happen. I believe Trump is not against all minority groups but is against illegal immigrants, bringing in unfettered foreigners, and has been brandished as a scoundrel. We have all made mistakes, made comments we regret, and have opinions that others find offensive. I believe he needs to filter what he says a bit more and consider who might be offended because he does not clearly define exactly what he truly wants to communicate. A little bit about Melania Trump on her expectations of her role as First Lady. I believe her calm and collected demeanor will create balance in the US and will benefit her husband, exponentially. She is a lady of grace. I truly feel that in democratic countries we must not feel afraid to share differing opinions. With respect and understanding we may be able to appreciate one another's points of view, whether we agree or not. We learn by listening to other perspectives, sharing our thoughts in professional ways, challenging each other but also ourselves, to always see hope in any situation and to understand the importance of democracy and of the need for a peaceful transition of government. Thanks Tanya for sharing your thoughtful views in such a caring way. May our professional discussion continue as we learn from one another. As Trudeau, Obama and Hillary have all shown us today the importance of moving forward in respectful ways even though we may have different views. Tanya, I agree with everything you just said, people are over reacting in this issue. I believe that there is a lot of good in how the election turned out and its even more evident through Putin saying that he is glad to do business with america now which will open up much more trade opportunities for the country. I'm a little upset about NAFTA because I order a lot of stuff online so it'll probably mess with the prices. I am upset by Trump winning presidency because of his beliefs/views of women, the LGBTQ community, Latino community, Muslim community and all of the other people he has such warped views of. I am all for people having their own beliefs and view points, but when it comes to the point of tearing a person or group down is where I think its not longer 'free speech', but hate speech. Now maybe he will be great in the financial sector as Tanya mentioned, but I think his beliefs will affect his actions and government policies in a negative way. I found it funny that in his acceptance speech, Trump would say something about healing the divisions in the country when he was the one who helped rip open those wounds of division in such a public manner. But, of course, only time will tell. I am hoping that Trump's misogynistic, bigoted views will not have a lasting effect on their country and the world. Also, I noticed the children in my 2/3 class were talking about the election. One boy said that since Trump is president, world war III is going to happen. The teacher told him that the American people voted and that's who they chose to be their leader, Trump didn't just take over. The people chose him. That seemed to settle the situation at that moment. I just wonder what else is going on in his mind and the minds of all the children who may not comprehend what is going on. I also wonder about the children growing up hearing Trump's views and thinking it's normal and okay to judge women on their looks and its okay to call a women fat or ugly if they feel that is so. Or that its okay to treat women as sexual objects. But again, we shall wait and see what comes of this unfortunate situation.